After getting back into woodworking after a layoff of more than 25 years, I bought the recently published Back Issue Library from Shop Notes. 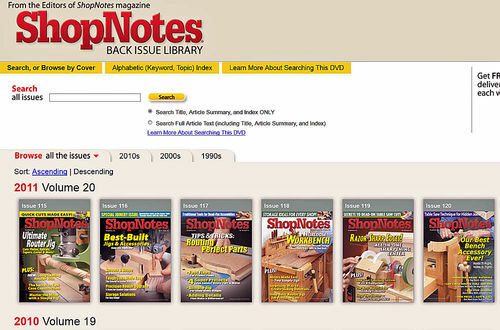 As advertised, the DVD contains the first 120 issues of Shop Notes. I am still going through the various issues. With that said, I typed in “workbench” and got 51 articles containing “workbench”. Basically, what you see on the screen is exactly what the magazine looks like with two pages displayed just as if you had it open on your desk. For $99, I think I got a fair deal and a whole lot of catching up to do. And…I subscribed to shop Notes two issues ago. Hope you find this review usefull. Note: I did find one page that was upside down. :-) I guess the person in charge of scanning goofed up. Nice review, Have been kicking arund buying this as I have about 4 yrs worth now in the shop. Thx for the info. By far one of the best and ost useful magazines out there. You know, if you bought this, I don’t think there would be ANYTHING you couldn’t find to fill a shop need. At this point I can’t imagine a need for the shop that ShopNotes has fulfilled in one way or another. Here is a screen shot of the DVD file listing. All you do is insert the DVD into your computer and double click the file named “Start Here ShopNotes Back Issue Library”. Might just have to get this. Thanks for the review! I heard a complaint once that it was difficult to navigate. Do you find this to be the case? Not sure if you are talking about the same product. This is a recently published item. Adobe Acrobat allows you to navigate the document easily…up arrow/down arrow goes to previous/next page (which is two pages of the magazine displayed side by side). Use the scroll wheel on your mouse to do the same. Zoom in or out for a better view. Easy as pie. Print what you want page only, or a series of pages. As far as navigating the many issues. Click on one and view it individually or search by tag and see all of the items in a list of results. Click on the one you choose and browse. Is there a catalog on the DVD where you can search by project? Or can you only flip through? Fine Woodworking tried it, but I feel it failed miserably. @Milo – I don’t think so. I am still learning more about the contents. So far, all I have done is browse the individual issues after looking at all of the covers. And I have searched for things like router table, workbench and a few other things that resulted in lots of articles in the various issues. Nice review, and I think shop notes is a great publication. If they’re PDF files, you should be able to put them on your iPad pretty easily. That seems like a great addition, and possible replacement for having dozens of old mags and paper on a shelf in the shop. Love the concept, may have to buy this. Thanks for reviewing and making me aware!! Nice – I have these as well. Love them. @ Tennessee… In my case, I didn’t have anything so it is a bargain for me. I had this given to me as a gift I really like it even though I own all the hard copies already ,it’s much easier to search. The first 110 issues can be downloaded from the internet for free, but they are the complete publication of each issue, so there is no search engine. You need to know what issue you want to review. I know, I know.. but the price was right, so I have 110 issues on my aux. hard drive.